I wanted to know how to use my computer. I felt like such an idiot - I'm only 42, but I found I could even lose my job if I didn't "modernise". I also felt so stupid when I watched the kids just jump on the computer and seem to do everything at lightening speed. I was just scared to even turn it on - it's totally different to the ones at work where you just do what you're told to. There was no way I was going back to college either - they wanted me to spend a year there and take exams. I had already tried Learndirect, but they only seem interested if I wanted to do my English and Maths or get an NVQ. Magimedia solved this for me - I had some private tutoring on fun things like downloading music and playing with photos as well as some more serious things like email and backing up my information. It really made me feel so proud when one of the kids actually asked me how to attach a photograph to an email! We can tailor private tuition to your needs, and because we work with you, the pace is set by how much you can take in and remember and how long you want your tuition to be. 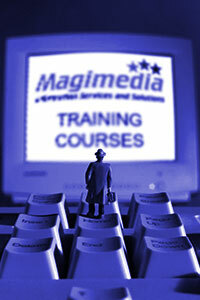 Magimedia use professionally qualified and trained tutors. We can cater for everything from the very basics of using your computer, through to more complex use of software such as Photoshop, Quark Express, Cubase and others. We can also act as a liaison with your company to arrange private training for you on your company's own software systems. Solve your computing problems today by giving Magimedia a call and discussing what it is you want to do on your computer, and you could be achieving it quicker than you ever thought possible.